Mother`s love for her son is something transcendent which only women, who have a child, can understand. 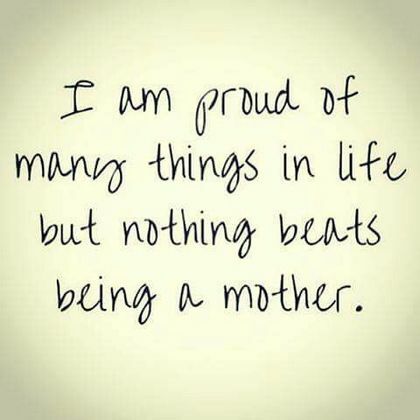 Being a mom makes a woman discover her extraordinary capacity to love and care for another being. 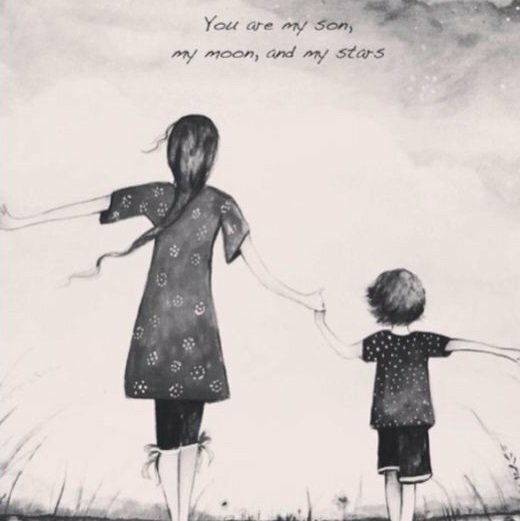 There are not enough words to describe the incredibly beautiful bond which mothers and sons share, but son sayings and family love quotes aim to celebrate this profound connection. Having a son is one of the greatest blessings in the world, and no matter the age of the son, the mother will always see in him the baby she once held in her arms. Mother and son quotes will be reminded of how much son means to mom. It is a powerful and unconditional family love connection. If you’re searching for the best sayings and images to share with your family members… look no further! From the little sister quotes, father daughter quotes, and brother quotes, we’ve got you covered. It feels like I just closed my eye for a moment, and then here are you are all grown up already. Time flies by so quickly, and I just want time to slow down a bit. 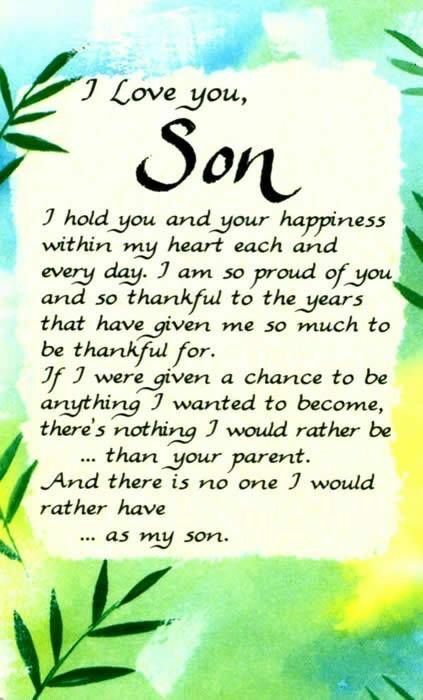 I love you son, and I always will. I can’t thank God enough for gifting you to me. You have always been the best child of mine. I love you. I have always tried to provide you with the best of everything. May you find happiness in your life! 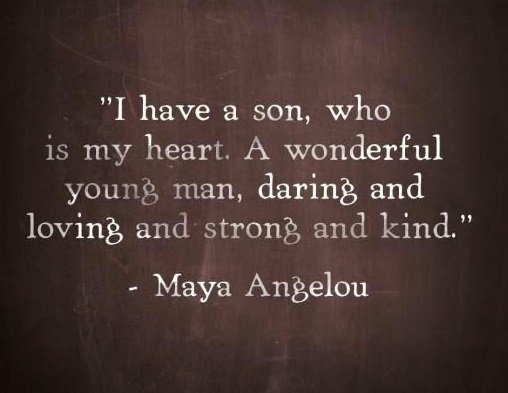 I cannot be more grateful for the things that I have because I love my son and I have him. My son, you are the reason that I am living today. You’re my world. I have been struggling for a long in my life to provide you comfort, and I’ll always be doing the same for you till my last. I love you! Son, you will outgrow my lap, but never my heart. 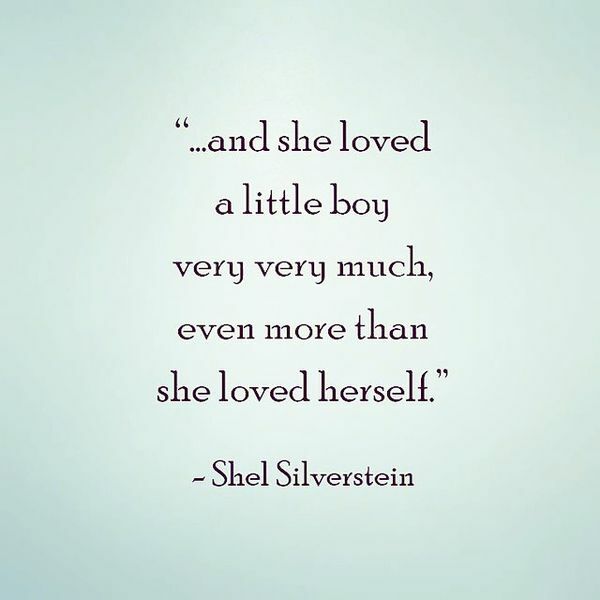 To my son, never forget that I love you. Life is filled with hard times and good times. Learn about everything you can. Be the man I know you can be. I love my son and he makes me proud and brings me happy whenever he’s around me. I will be there for you all the time and be that pillar of strength that you can always rely on to support you through life. I love you, dear son. I believe in you, my son. I believe that you’ll be the luckiest person in this world because I have worked my whole life in bringing the best out of you. I love you with all my heart! The bond between mother and son lasts a lifetime. The bond between mother and son is a special one. It remains unchanged by time or distance. It is the purest love, unconditional and true. It is understanding of any situation and forgiving of any mistake. Children, I hope I can bring you as much happiness as you bring to my life. I love you more than you can ever imagine and I’ll do everything within my power to ensure you have everything you need in life because I want nothing but the best for you. I pray for your happiness every day. I am proud of the man that you have become, and I know that there’s nothing that you cannot do in the future. I love you, son! Never forget that I love you. Life has its ups and downs, but I know you will be able to overcome them with your head held high. I believe in the man that you can be, son. I love you! My son, live your life to the fullest. Spread your wings and fly high up in the air. You can achieve much greater things in your life because you’re my son, and I have put my trust in You! I love you son. I will always be your number one supporter for I care for you the most in this life of ours. To my dearest son, never forget that I love you and that I will always have your back. Whatever will come your way, know that you will always have my guidance and support. I love you! I think you might have been an angel sent by the heavens above to me, you make me happy. I loved to watch you play in the yard and now, I like to see you tackling with every trouble firmly. I’ll be there to help you, hold you up, to give you a shoulder every time you need because I love you son. My children are the reason that I smile, that I laugh, that I cry, they are my happy place, my frustration. They are what makes my heart beat & sometimes break. My children are my everything. I can predict your future, it’s way too easy. You’ll be a handsome man, very fine and classy. You will soar to new heights, not just because you are my son. But because of your heart, you are a lovely person. Your life will be perfect, just as it is now… you have no idea, that I love you and how. I want you to know that you can share all your sorrows and grieve with me because I am the only one who can love even your darkest side. My son, I love you very much! I want you to stay strong; no matter how rough may be the storm. You are a daring soldier who knows how to fight even if the blood’s bleeding because I have taught you to be a brave boy and never to give up. 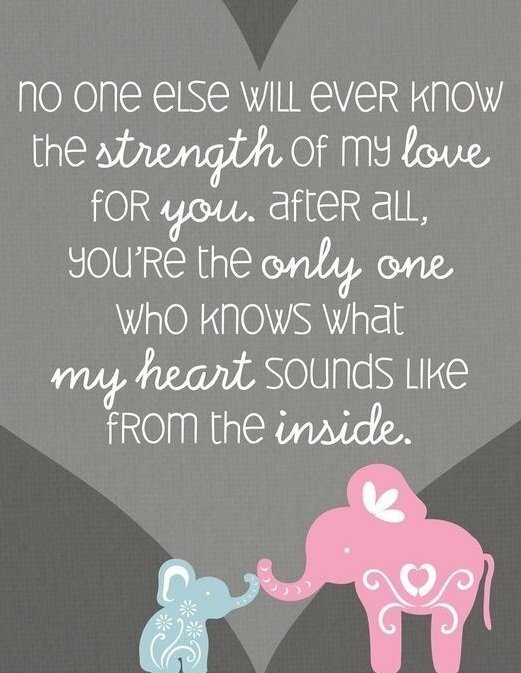 I know that I’m not the perfect parent, but I want you to know that I try very hard to give you the life that you deserve. If I disappoint you, I want you to know that it’s the last thing I want to do. I love you, my little son! I know that you are destined for great things. I know that you can achieve all the things that I never did because you are much braver than I could ever be. Keep flying high, my son! I love you. 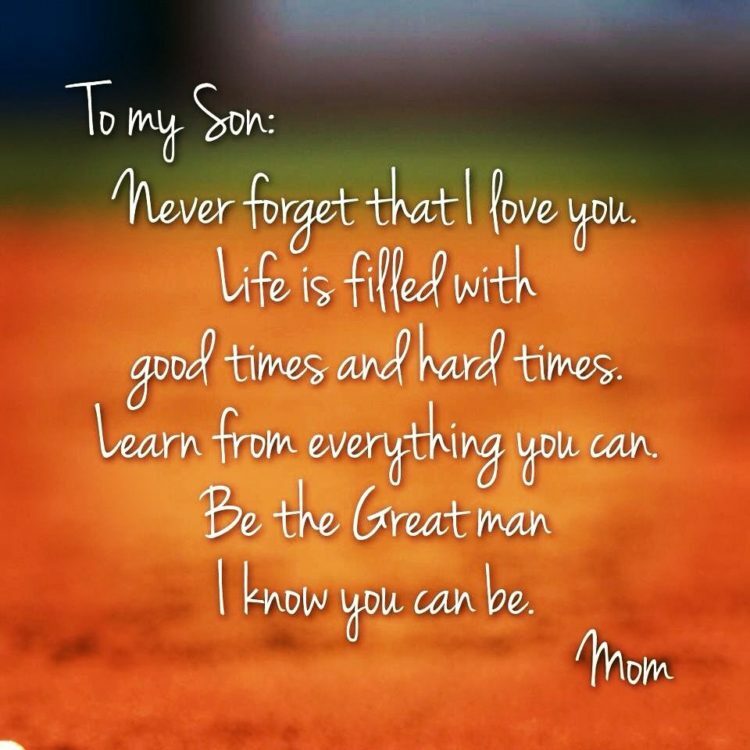 Son… I want you to remember, to never give up no matter what. I want you to keep going ahead, even if it pains a lot. I want you to understand, that life can be unfair. I want you to remember, that I will always be there. Before you came into this world, I didn’t know what my purpose in life was. And then you were born, and everything finally made sense. I was put into this world to be a good parent to you and help you become the person that you are meant to be. I love you, my great son! I should probably warn you that a lot of people will come and go in your life. You will lose people and you will meet new people. But I will always be here for you through all the changes. My love for you will never change. I want you to know that you can be anyone that you want to be. The world is your stage, and you have the whole world right in front of you. All you need to do is take that chance. Love you, son. Parents always think that they’ll change their children’s lives in the best way they can. But little do they realize, that the love of a child and hearing the words I love you mom will eventually change and shape their lives in a way that they can never imagine. That’s exactly what happened to us, we love you. If you have a daughter, then you should take a look at mother-daughter quotes, too!